With the recent publication of the IPCC special report on the 1.5° target and increased attention on carbon dioxide removal (CDR) technologies, we think it is time to advance from the current way to look at specific strategies forward to a more holistic CDR perspective, since multiple side effects may lead to additional CO2 uptake into different carbon pools. This paper explores potential co-benefits between terrestrial CDR strategies to facilitate a maximum CO2 sequestration effect. Weathering is a major control on atmospheric CO2 at geologic time scales. Enhancement of this process can be used to actively remove CO2 from the atmosphere. Field results are still scarce and with this experiment we try to add some near natural insights into dissolution processes. Results show CO2 sequestration potentials but also highlight the strong variability of outcomes that can be expected in natural environments. Such experiments are of utmost importance to identify key processes. We present a new modeling framework called Global Observation-based Land-ecosystems Utilization Model of Carbon, Nitrogen and Phosphorus (GOLUM-CNP) that combines a data-constrained C-cycle analysis with data-driven estimates of N and P inputs and losses and with observed stoichiometric ratios. GOLUM-CNP provides a traceable tool, where a consistency between different datasets of global C, N, and P cycles has been achieved. Human activities are drastically altering water and material flows in river systems across Asia. 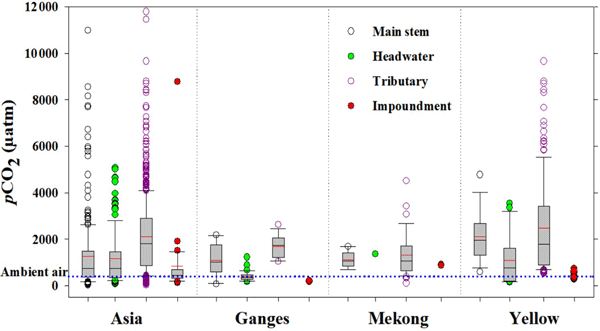 This review provides a conceptual framework for assessing the human impacts on Asian river C fluxes and an update on anthropogenic alterations of riverine C fluxes, focusing on the impacts of water pollution and river impoundments on CO2 outgassing from the rivers draining South, Southeast, and East Asian regions that account for the largest fraction of river discharge and C exports from Asia. Here we synthesize a wide range of global spatiotemporal observational data on carbon exchanges between the Earth surface and the atmosphere. A key challenge was to consistently combining observational products of terrestrial and aquatic surfaces. Our primary goal is to identify today’s key uncertainties and observational shortcomings that would need to be addressed in future measurement campaigns or expansions of in situ observatories. Seasonal response of air–water CO2 exchange along the land–ocean aquatic continuum of the northeast North American coast. This study quantifies the exchange of carbon dioxide (CO2) between the atmosphere and the land-ocean aquatic continuum (LOAC) of the northeast North American coast, which consists of rivers, estuaries, and the coastal ocean. Our analysis reveals significant variations of the flux intensity both in time and space across the study area. Ice cover, snowmelt, and the intensity of the estuarine filter are identified as important control factors of the CO2 exchange along the LOAC. Rivers export the products of continental weathering to the oceans. It is important to accurately constrain these fluxes to better understand global biogeochemical cycles. The riverine export of major cation species in particular contributes to regulate the long-term carbon cycle. In this work we quantify some additional fluxes to the ocean that may occur when solid sediments react with seawater in estuaries. These fluxes have been only poorly constrained so far. This study shows that the weathering rates of limestone, determined from of an ancient eroded edifice, can exhibit highly non-Gaussian behavior. Moreover, the asymmetric long-tailed curve was found to have similar characteristics to those of rate distributions measured on microscopic regions of limestone surfaces in laboratory experiments. Such similar behavior could reflect analogous chemical and mechanical weathering mechanisms operating over a range of spatial and temporal scales. Aiuppa, A., Allard, P., D'Alessandro, W., Michel, A., Parello, F., Treuil, M., and Valenza, M.: Mobility and fluxes of major, minor and trace metals during basalt weathering and groundwater transport at Mt. Etna volcano (Sicily), Geochim. Cosmochim. Acta, 64, 1827–1841, 2000. Amiotte-Suchet, P. and Probst, J. L.: A global model for present-day atmospheric/soil CO2 consumption by chemical erosion of continental rocks (GEM-CO2), Tellus B, 47, 273–280, https://doi.org/10.1034/j.1600-0889.47.issue1.23.x, 1995. Balagizi, C. M., Darchambeau, F., Bouillon, S., Yalire, M. M., Lambert, T., and Borges, A. V.: River geochemistry, chemical weathering, and atmospheric CO2 consumption rates in the Virunga Volcanic Province (East Africa), Geochem. Geophys. Geosyst., 16, 2637–2660, https://doi.org/10.1002/2015GC005999, 2015. 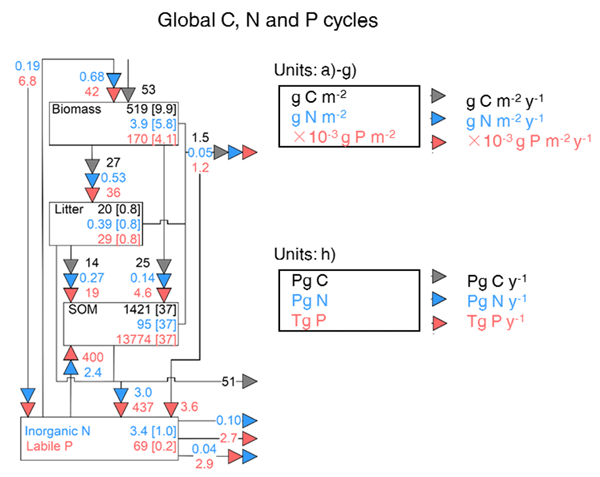 Berner, R. A., Lasaga, A. C., and Garrels, R. M.: The carbonate-silicate geochemical cycle and its effect on atmospheric carbon dioxide over the past 100 million years, Am. J. Sci., 283, 641–683, 1983. Bluth, G. J. and Kump, L. R.: Lithologic and climatologic controls of river chemistry, Geochim. Cosmochim. Acta, 58, 2341–2359, 1994. Caldeira, K. and Rampino, M. R.: Carbon dioxide emissions from Deccan volcanism and a K/T boundary greenhouse effect, Geophys. Res. Lett., 17, 1299–1302, 1990. Cohen, K., Finney, S., Gibbard, P., and Fan, J.-X. : The ICS international chronostratigraphic chart, Episodes, 36, 199–204, 2013. Coogan, L. A. and Dosso, S. E.: Alteration of ocean crust provides a strong temperature dependent feedback on the geological carbon cycle and is a primary driver of the Sr-isotopic composition of seawater, Earth Planet. Sci. Lett., 415, 38–46, https://doi.org/10.1016/j.epsl.2015.01.027, 2015. Dessert, C., Dupré, B., François, L. M., Schott, J., Gaillardet, J., Chakrapani, G., and Bajpai, S.: Erosion of Deccan Traps determined by river geochemistry: impact on the global climate and the 87Sr/86Sr ratio of seawater, Earth Planet. Sci. Lett., 188, 459–474, https://doi.org/10.1016/S0012-821X(01)00317-X, 2001. Dessert, C., Dupré, B., Gaillardet, J., François, L. M., and Allègre, C. J.: Basalt weathering laws and the impact of basalt weathering on the global carbon cycle, Chem. Geol., 202, 257–273, https://doi.org/10.1016/j.chemgeo.2002.10.001, 2003. Fekete, B. M., Vörösmarty, C. J., and Grabs, W.: High-resolution fields of global runoff combining observed river discharge and simulated water balances, Global Biogeochem. Cy., 16, 15-1–15-10, https://doi.org/10.1029/1999gb001254, 2002. Ferrier, K. L., Riebe, C. S., and Jesse Hahm, W.: Testing for supply-limited and kinetic-limited chemical erosion in field measurements of regolith production and chemical depletion, Geochem. Geophys. Geosyst. 17, 2270–2285, 2016. Gaillardet, J., Dupré, B., Louvat, P., and Allègre, C. J.: Global silicate weathering and CO2 consumption rates deduced from the chemistry of large rivers, Chem. Geol., 159, 3–30, https://doi.org/10.1016/S0009-2541(99)00031-5, 1999. Gaillardet, J., Rad, S., Rivé, K., Louvat, P., Gorge, C., Allègre, C. J., and Lajeunesse, E.: Orography-driven chemical denudation in the Lesser Antilles: Evidence for a new feed-back mechanism stabilizing atmospheric CO2, Am. J. Sci., 311, 851–894, 2011. Goddéris, Y., Donnadieu, Y., Nédélec, A., Dupré, B., Dessert, C., Grard, A., Ramstein, G., and François, L. M.: The Sturtian “snowball” glaciation: fire and ice, Earth Planet. Sci. Lett., 211, 1–12, https://doi.org/10.1016/S0012-821X(03)00197-3, 2003. Goll, D. S., Moosdorf, N., Hartmann, J., and Brovkin, V.: Climate-driven changes in chemical weathering and associated phosphorus release since 1850: Implications for the land carbon balance, Geophys. Res. Lett., 41, 3553–3558, https://doi.org/10.1002/2014GL059471, 2014. Hartmann, J. and Moosdorf, N.: The new global lithological map database GLiM: A representation of rock properties at the Earth surface, Geochem. Geophys. Geosyst., 13, Q12004, https://doi.org/10.1029/2012gc004370, 2012. Hartmann, J., Jansen, N., Dürr, H. H., Kempe, S., and Köhler, P.: Global CO2-consumption by chemical weathering: What is the contribution of highly active weathering regions?, Global Planet. Change, 69, 185–194, 2009. Hartmann, J., Li, G., and West, A. J.: Running out of gas: Zircon 18O-Hf-U/Pb evidence for Snowball Earth preconditioned by low degassing, Geochem/ Perspect/ Lett/, 4, 41–46, https://doi.org/10.7185/geochemlet.1734, 2017. Hijmans, R. J., Cameron, S. E., Parra, J. L., Jones, P. G., and Jarvis, A.: Very high resolution interpolated climate surfaces for global land areas, Int. J. Climatol., 25, 1965–1978, 2005. Jacobson, A. D., Grace Andrews, M., Lehn, G. O., and Holmden, C.: Silicate versus carbonate weathering in Iceland: New insights from Ca isotopes, Earth Planet. Sci. Lett., 416, 132–142, https://doi.org/10.1016/j.epsl.2015.01.030, 2015. Kent, D. V. and Muttoni, G.: Modulation of Late Cretaceous and Cenozoic climate by variable drawdown of atmospheric pCO2 from weathering of basaltic provinces on continents drifting through the equatorial humid belt, Clim. Past, 9, 525–546, https://doi.org/10.5194/cp-9-525-2013, 2013. Li, G. and Elderfield, H.: Evolution of carbon cycle over the past 100 million years, Geochim. Cosmochim. Acta, 103, 11–25, https://doi.org/10.1016/j.gca.2012.10.014, 2013. Li, G., Hartmann, J., Derry, L. A., West, A. J., You, C.-F., Long, X., Zhan, T., Li, L., Li, G., Qiu, W., Li, T., Liu, L., Chen, Y., Ji, J., Zhao, L., and Chen, J.: Temperature dependence of basalt weathering, Earth Planet. Sci. Lett., 443, 59–69, https://doi.org/10.1016/j.epsl.2016.03.015, 2016. Rad, S., Rivé, K., Vittecoq, B., Cerdan, O., and Allègre, C. J.: Chemical weathering and erosion rates in the Lesser Antilles: An overview in Guadeloupe, Martinique and Dominica, J. South Am. Earth Sci., 45, 331–344, https://doi.org/10.1016/j.jsames.2013.03.004, 2013. Rivé, K., Gaillardet, J., Agrinier, P., and Rad, S.: Carbon isotopes in the rivers from the Lesser Antilles: origin of the carbonic acid consumed by weathering reactions in the Lesser Antilles, Earth Surf. Process. Landf., 38, 1020–1035, https://doi.org/10.1002/esp.3385, 2013. Schaller, M. F., Wright, J. D., Kent, D. V., and Olsen, P. E.: Rapid emplacement of the Central Atlantic Magmatic Province as a net sink for CO2, Earth Planet. Sci. Lett., 323–324, 27–39, https://doi.org/10.1016/j.epsl.2011.12.028, 2012. Taylor, A. and Blum, J. D.: Relation between soil age and silicate weathering rates determined from the chemical evolution of a glacial chronosequence, Geology, 23, 979–982, 1995. Teitler, Y., Le Hir, G., Fluteau, F., Philippot, P., and Donnadieu, Y.: Investigating the Paleoproterozoic glaciations with 3-D climate modeling, Earth Planet. Sci. Lett., 395, 71–80, https://doi.org/10.1016/j.epsl.2014.03.044, 2014. Walker, J. C. G., Hays, P. B., and Kasting, J. F.: A negative feedback mechanism for the long-term stabilization of Earth's surface temperature, J. Geophys. Res.-Oceans, 86, 9776–9782, https://doi.org/10.1029/JC086iC10p09776, 1981. Wolff-Boenisch, D., Gislason, S. R., and Oelkers, E. H.: The effect of crystallinity on dissolution rates and CO2 consumption capacity of silicates, Geochim. Cosmochim. Acta, 70, 858–870, 2006.